Patients who require a hearing aid repair must contact the Audiology department for an appointment. Patients can call the repair line on 01482 624734 leaving their full name and telephone number on the answering machine for a member of the Audiology team to call them back with an appointment. Appointments can also be requested by text on 07799895033, by fax on 01482 624745, or by email: audiology@hey.nhs.uk. You can have your hearing aid repaired at the following clinics. Please state when making the appointment at which clinic you would like to be seen. WE UNFORTUNATELY WILL NOT BE ABLE TO SEE PATIENTS WITHOUT AN APPOINTMENT. Please post or drop your aid into us including stamps covering £1.24 for the return postage. A description of what the fault is would also be helpful. We will return the aid to you in the post as soon as possible. Or North Point Customer Service Centre: North Point Centre, Bransholme. Calvert Centre (Customer Service Centre & 1st Floor): 110a Calvert Lane, Hull. HU4 6BH. Surgery Hours. Diadem Medical Practice: 2 Diadem Grove, Hull. HU9 4AL. Dr A.K. Datta’s Surgery: Dr Datta patients only. Littondale, Sutton Pk, Hull. HU7 4BJ. Surgery Hours. Elliott Chapell Health Centre: 215 Hessle Road, Hull. HU3 4BB. George St Customer Service Centre: Kenworthy House, George Street HU1 3DT. Holderness Road Customer service Centre: The Mount, Holderness Road. Howden Medical Centre: Pinfold Street, Howden. DN14 7DD Tel: 01430 430318 – Mon to Fri 8.30am to 12.45pm & 1.45pm to 6.00pm, closed Thurs pm. Hull Royal Infirmary Main Reception: Anlaby Road, Hull. HU3 2JZ. 24 hours. Ings Customer Service Centre: Ings Centre, Savoy Road HU8 0TX. Orchard Park Customer Service Centre: Orchard Centre, Orchard Park Road HU6 9BX. Preston Road Customer Service Centre: Preston Road Village Centre, Preston Road HU9 3QB. Walker St Customer Service Centre or Riverside Medical Centre Reception: The Octagon, Walker St, Hull HU3 2RA. Surgery Hours. Old batteries can be handed in to the Audiology department at either Hull Royal Infirmary or Castle Hill Hospital for recycling. Most supermarkets will also offer battery recycling facilities. Action on Hearing Loss (formerly RNiD) are a nationwide charity. 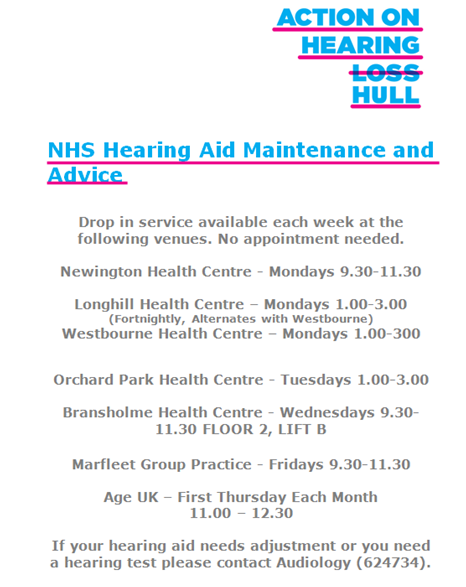 They have various drop in clinics across Hull which covers the majority of Hearing Aid maintenance, please drop in and See Lizzi or the other Volunteers to get your tubing changed approximately every 6 months. introduction to other useful equipment. Unfortunately this service is presently only available to people who live within the Hull catchment area.